I’ve been using a Lenovo ThinkPad T61 Widescreen as my primary work computer for going on 2.5 years, and I’ve been very happy with it. It’s no Macbook Pro, but it’s about as good as it gets for a non-Apple laptop: Fast, well-built, reliable, good technical support, and has a great keyboard. But in that time, problems developed. It started taking over five minutes after booting up for Windows XP to get to a usable state. Outlook 2007 got sluggish. There was a weird issue with Google Chrome, where it would randomly cause the entire system to freeze – forcing me to do a hard restart using the power button. I started thinking it might be time to petition the boss for a new computer. Instead, I took the opportunity to upgrade to an inexpensive hard drive with twice the capacity and to finally make the move to Windows 7. I previously tested this version for a bit in a VMware virtual machine when Microsoft was asking people to beta test the operating system before its official release, so I never got to know it well. But having used it exclusively for a little over a month, I can tell you that I’m a big fan. Read on for more details in my leap from Windows XP to Windows 7. It’s almost comical how much work Microsoft put into the Windows 7 installer given that it’s usually a one-time deal, but the process does set expectations for what’s to come. In that context, it was well worth their efforts. I started a clean install before dinner on a Friday night and when we finished about 40 minutes later, I was surprised to see it had already finished and ready to use. No prompts, no waiting for me to answer a question at some arbitrary screen, just the Windows desktop – ready to use. Every hardware device built into my ThinkPad was identified by Windows 7 during the installation process, so there was no need to hunt down WiFi or video card drivers after the fact. Most surprising was that the T61’s built-in fingerprint reader worked without installing Lenovo’s client security software, thanks to the Windows Biometric Framework API introduced in Windows 7. 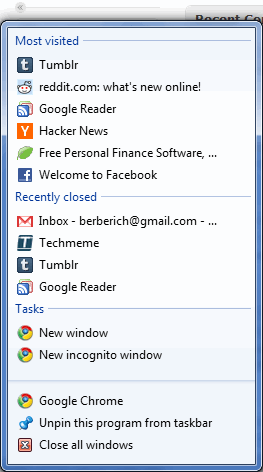 I love what Microsoft has done with the Start Menu and Taskbar in Windows 7. I know, I know – some of these changes were made in Vista. But considering that I spent all of an hour using that version of Windows, it’s all a new experience for me. 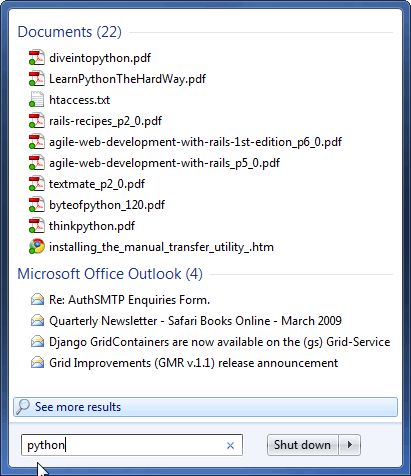 I used Windows Desktop Search in XP, mainly to find old emails and information in PDF technical documentation. Searching was sort of slow and indexing seemed to be a drag on the system, but it got the job done. 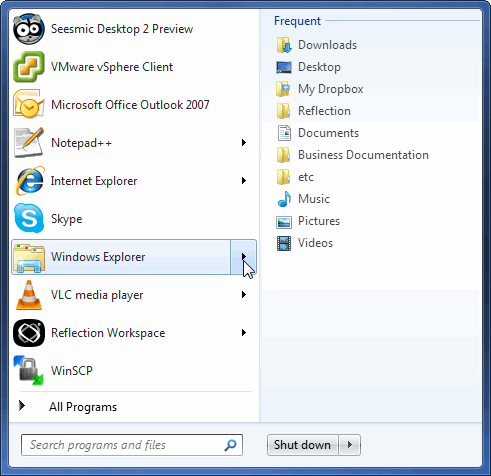 In Windows 7, search is built into the system for seemless access everywhere. One of my favorite features of the Start Panel (which I didn’t mention above) is the search bar at the bottom. Hit the Start button on the keyboard, start typing, and within a second you can launch an application buried deep within All Programs. If you’re looking for text within a document or a file’s metadata, it just tasks a few more seconds to find and open it. For me, having one button access to fast system-wide search has been the biggest productivity booster since switching to Windows 7. I rarely have to venture into the program menu, and opening a folder is a few keystrokes instead of navigating a series of nested folders. Easily one of my favorite features. When Windows XP was first released, multi-screen computing was a novelty, and it showed in the basic support it offered for more than one monitor. Lenovo’s software made things more bearable on my ThinkPad, but switching between the built-in screen and the two LCD monitors attached to the dock on my desk sometimes felt like it was a kludge and not something I should be doing on a regular basis. 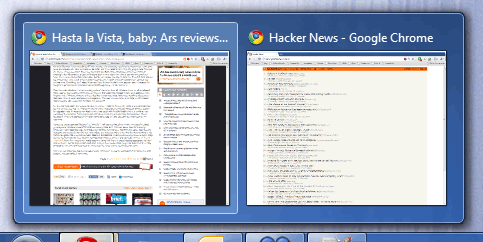 Thankfully, using two monitors with Windows 7 feels much more natural. There is still room for improvement, such the ability to extend the Taskbar or backgrounds across more than one screen, but it’s good enough that I didn’t have to install Lenovo’s software in order to manage things. I’ve been extremely happy with how Windows 7 performs on my ThinkPad T61. I wasn’t expecting it to feel faster than XP, but it does in every task. Granted, it’s hard to determine how big a role the new hard drive plays in the speed increase verus the clean install of Windows. In any case, it’s a noticeable improvement, and makes me glad I did the upgrade. 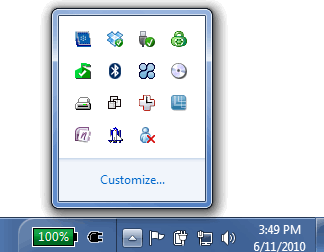 Also, while the laptop tool over five minutes to boot into Windows XP, it’s down to about a minute with Windows 7. Shutdown time, too, is usually a lot faster, though a few times a week it takes about five minutes for the process to finish at the end of the work day. I haven’t bothered to investigate potential causes yet, but you can be sure I will if it starts happening more often. I couldn’t be happier with my upgrade from Windows XP to Windows 7. It’s fast, rock-solid (I haven’t seen any of the crashes or freezes I constantly had before), and has some great new features that make me more productive.